Ok, someone's got a great sense of humour over at Twelvesouth. I totally love the idea of walking around carrying a beautiful weathered leather book while everyone else is showing off their laptops. And one that hides a Macbook - well, if I owned a Macbook, that would be even better! Honestly, this is an incredible case: all leather with soft padded interior, zips closed. And you can hide your Macbook in your home library (if you even have one anymore) for security. 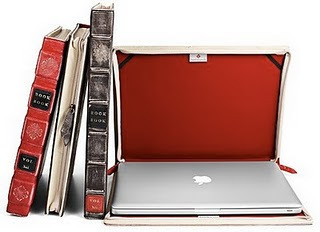 Love their tag line too: "A novel way to cover your Macbook". Check it out over at TwelveSouth.